Chicken thigh meat, hand threaded onto a half paddle bamboo skewer. Perfect for finishing with your favorite sauce accompaniment. From Frozen Bake in a Pre-Heated 350 ºF Convection Oven for 6 - 8 minutes. Cook until Internal Temperature Reaches 165 ºF as Measured by Use of a Thermometer. 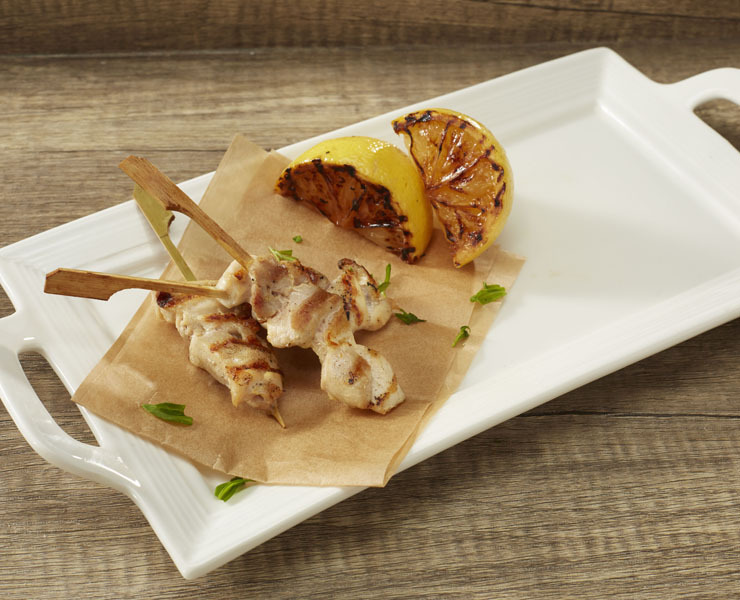 "For an enhanced visual presentation and flavor retention, from frozen, pan sear satay/brochettes for 45 seconds. Then bake in a pre-heated 350 ºF Convection Oven for 6-8 minutes or until internal temperature reaches 165 ºF as measured by use of a thermometer." noodle salad. Pair with a lemon tzatziki sauce, with fresh pita and cucumber salad.